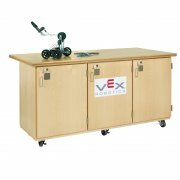 VEX Robotics Club Furniture from Diversified Woodcrafts is custom designed for the needs of your robotics classes, teams and clubs. 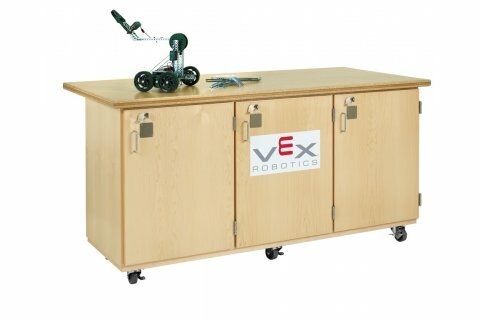 Created with the collaboration of VEX Robotics, Project Lead The Way and the real experts on the ground: the teachers and students, these models have everything you need to create, store and tinker with your robots. 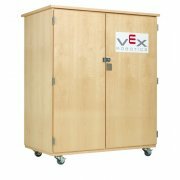 Every team in your VEX Robotics club can easily store tools and robots in cabinets designed for this very purpose. Pull-out shelves with full extension glides are a perfect fit for robots-in-progress, enabling students to lift up prototypes without damaging them. Padlock hasps ensure that each team's ideas, parts and tools are safely stowed away and ready for the next session. No matter where your robotics club is meeting, heavy-duty locking casters help you get all tools and supplies in the right place.